Butter one side of each piece of bread, and coat with grated parmesan cheese. 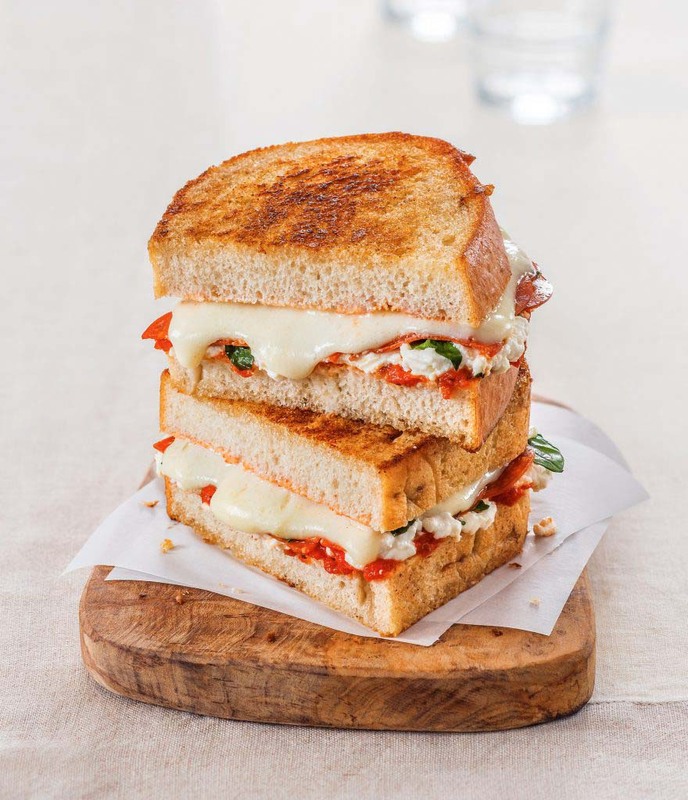 On 4 of the unbuttered sides of bread, spread a layer of ricotta and then add a layer of tomato sauce. Next add 4 fresh basil leaves, 10 pepperoni, and 2 mozzarella slices to each. Heat a large frying pan to medium heat and add butter to the pan. Add 2 of the open sandwiches with the buttered side down. Put 2 of the top slices of bread with buttered side up on top and cook for about 4 to 5 minutes. Flip and repeat until cheese is melted and bread is golden brown and remove from pan. Add more butter and repeat again to cook the last 2 sandwiches. Cut each sandwich in half, plate, and serve.